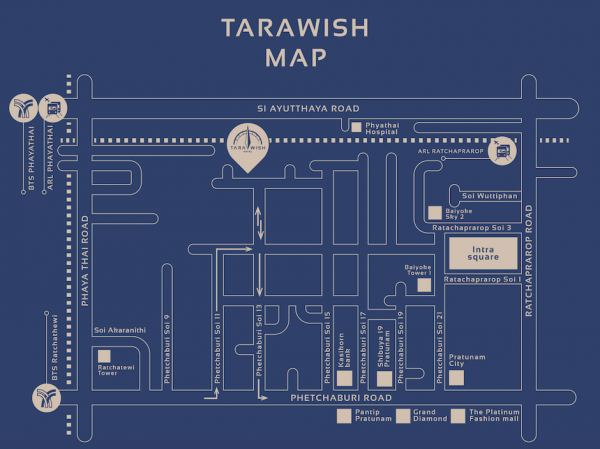 Tarawish Hotel is located in Ratchathewi, one of Bangkok’s most convenient and easily-accessible areas in the heart of Thailand’s capital. Tarawish is close to a vibrant neighborhood including the energetic Pratunam shopping zone whilst also being safely nestles in a tranquil lane away from the crowds. Situated on Soi (Lane) Petchaburi 13, Tarawish is close to important landmarks as well as leading shopping centers at Siam Square. There are two major skytrain links at the nearby BTS Ratchathevi Station and Airport Link Phayathai Station, and there are many public buses and taxis to commute to all over Bangkok.